Digital alien-ation: Is ET future me? Picture an alien. Not the special-effects-giant-spitting-something kind, but the kind with the big head, skinny body, giant thumb digits on three-fingered hands and a slight greenish-grey tint to its skin. We’ve all seen them, or pictures of them, right? 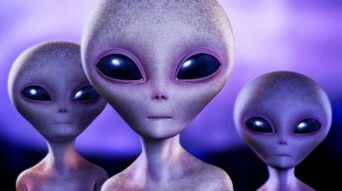 There are some scientists who believe that, not only are these creatures real, but they are not so much aliens as future humans coming back to communicate with us. I think they’re on to something. The future we really could be those little green men. People, we are living in an exciting time. It’s the beginning of the next phase of humankind. We have begun the morphing into our new selves. Next time you’re out in public, look around. If one out of every three people you see isn’t on a phone or device of some kind, I’d be very surprised. We’re texting, Facebooking, Pinterinstagraming. You know, enjoying life or rather, the electronic representation of life. Heads down, fingers whirling, we’re at one with our devices. Sharing in a way that is so much easier than the sharing our mothers told us to do  and so much quicker. We can watch someone report the news on our screens while more news scrolls along the bottom and an ad pops up in the corner. Our brains are filling with information, valuable, important information. Information as important as a government overthrow or a proclamation about the longing for the end of a workday so grueling it included the ability to post about it on a social network. We need bigger heads for all that info. And, in the event that post at work wasn’t exactly sanctioned, we need strong thumbs to text those lamentations quickly. Big heads, big thumbs. It’s the future us, baby! Back to that next-time-you’re-in-public thing, do you remember when people used to meet there? Not a “Hey, I’ll meet you at Sunbucks” meeting but a “Hello, my name is…” meeting. Seriously! It happened. People made new friends that way. As scary as that sounds, it’s true. People’s friend requests were confirmed on the spot and sometimes they shared a laugh, out loud, together. People even started romantic relationships that way. Again, I’m totally not kidding. Sure, it didn’t feature the same spinability that writing your own personal description online has, but, somehow, they saw through the lack of deception and made it work. Former humankind survived a lot. Future humankind is going to be awesome. Our big heads, linked of course to our big thumb print-recognized devices, will have integrated apps for everything. People in Seattle will be able to click on the Sunset App and the big eyes in their big heads will look at the rain-drenched end of the day and see a glorious sunset. They will, of course, be able upload their vision too so their friends can share in the amazing sunset that didn’t really happen. And, think about the amazing Dinner Date App. Instead of actually meeting at the restaurant and texting other people over dinner, you will be able to simultaneously project yourself holograhpically paying attention to your date at the restaurant so that the you at home can better focus on the texts and emails to friends or witty social network posts about manners. Technology makes things easier. It does a lot of work for us. When’s the last time you did long division? When’s the last time you’ve even heard that phrase? So, with all our menial tasks either being done for us or done much faster, what are we doing with all that spare time? Surely not long division. One Saturday, I watched a whole season of “The Bionic Woman.” Talk about technology, except why did she always have to move her hair if her bionic ear was so good? But I digress. Technology lets us do more. To be clear, I love technology. Science rocks! I’d be a super techie geek, if I were a little smarter. After all, without technology, I would be unable to promote my argument here in cyberspace. And, my argument is this: technology is fantastic, but we don’t need it 24/7. Put the phone down every now and then. Step away from the tablet! Look around and take in the world and the people around you — just for you. You don’t have to share everything you do with the World Wide Web. A group called Reboot started the Sabbath Manifesto and the National Day of Unplugging. Twenty-four hours, sundown Friday to sundown Saturday, 1440 minutes gadget-free. Clearly insane, right? I decided to check this out as they must be an isolated bunch of religious nuts. Nope. Turns out a lot of religions and scientists recommend rest for the current we. Who knew? Wait, what? Drink wine? Light candles? Find silence? Ha! The last time I was in silence was when the power went out in a storm! And, as a matter of fact, I used candles then too and a little wine. Actually, that was a fun night (snicker, snicker)! Nearly everything we do is facilitated, documented or, in some way involves, our devices. I must admit experiencing that whole body, adrenaline-releasing sensation elicited by the thought that I’ve lost my phone. EVERYTHING is in there! What if it weren’t? We are tethered to our tablets. Our phones smartly project our virtual image, but perhaps, we’re losing track of our actual image. What is it we enjoy doing  besides posting funny comments on other people’s funny thoughts? When you think about it, right now, someone is commenting on some site on the Web about the ridiculousness of some reality show, while actual reality is happening all around them  and a lot of that is even more ridiculous. What if instead of paying attention to them, we paid attention to us? We had a conversation, out loud, in real time, with another human being who’s standing right next to us. Or we went out and experienced that rain on our tiny little heads or saw the sunset with our wee little eyeballs. Don’t get me wrong, I’m all about technology. I’ve still got a season left of “The Bionic Woman”  you know after she gets Max, the bionic dog. But the real world can be pretty awesome, too. I think there might just be something to this unplugging thing. Maybe we should all spend a little more time looking around us, here and now, in the real word. After all, it’s soon to be overtaken by our big-headed, big-thumbed, green selves. Posted March 20th, 2014 & filed under Blogs.